My name is Dana. 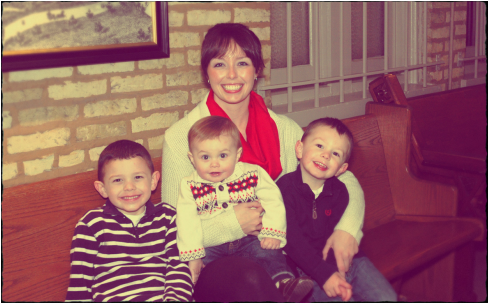 I am a Midwest momma to three little men. 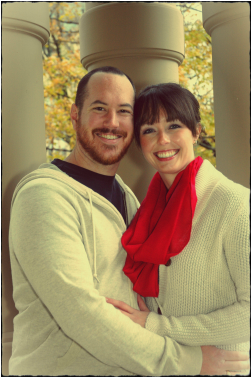 I am married to my high school sweetheart and best friend, Brian. He recently completed his Ph.D. in nuclear astrophysics. I could not be more proud of him! He is certainly the left brain of the family! We have recently uprooted from our cozy home in South Bend, IN/University of Notre Dame, and moved to the land of far, far away... California, for the next phase of Brian's career. It will be a challenging couple of years being so far away from home, but we hope to make it a fun adventure for our family! I am the right brain of the fam! I love crafting and decorating, so of course I am in love with Pinterest. I can shop till I drop. I am obsessed with all things baby, and have been since I was a little girl. I could be a baby concierge/baby registry assistant....it's a little out of control. Photography is a hobby that I love, but I still have a lot to learn! I also enjoy all genres of music, though my favorites are indie/ folk and alternative. I love Midwest summers, sitting by the pool and going to Lake Michigan as much as I can. There is nothing better than college football season! I bleed blue and gold for the FIGHTING IRISH! The song I have sung to my babies since their birth is the alma mater, "Notre Dame, Our Mother". I enjoy spending time with family and am so grateful to have each and every one of them. Last but certainly not least, I love my kiddos. BOY, do they keep me busy! I am typically knee deep in laundry, feeding kids and cleaning up messes. As a family, our lifestyle choices have been evolving. Brian and I have always been in love with good food. He loves to cook, (I loathe cooking) and we both LOVE to eat! With the arrival of our children, and our concern for their health and our own, we have taken a strong interest in the quality of our food and where it comes from. So, we have made the switch to eating as much organically grown food as we can afford. Our parenting style has evolved with the addition of each little member of our family. We have co-slept, bed shared, slept in separate rooms, breast fed, bottle fed, used jarred baby food, and made our own. We baby wear and we have four different stroller varieties. We watch way too much TV, and even have used it to lull two out of the three to sleep during transitional time from our room/bed to their own. Each of our boys have their own personality and we handle each situation the best way to meet the needs of the little one we are dealing with. We do our best to be consistent. That keeps everyone happy. As much as I want to have that peaceful non-yelling home, that just isn't our reality. We have three boys....it's never quiet. Hopefully we can slowly change that as the boys grow, and as we grow as parents. For now, we go with the flow! Lastly, we want to make a difference in the world. We hope to do that by setting an excellent example for our children and others by doing our part to take care of the world we live in. Whether it's as simple as being kind to one another within our home so our children are kind and generous additions to society, or as huge as some day adopting a child and showing the world we need to take care of one another no matter where you come from. Not only do we need to care for one another, but we also need to take care of our earth. We only have one, and we need to be sure to not over consume and take advantage of our natural resources as well as being resourceful and not wasteful! Don't replace something unless it is broken beyond repair and REDUCE, REUSE, RECYCLE! We have not inherited the land from our ancestors, we are borrowing it from our children. I recall my third grade teacher telling us we can make a difference in the world. It was a big deal...we even marched in a parade about it, I think. As a third grader, I used to think that just one person could not make a difference. The world is much too large for anyone to care about me and my opinion. As an adult, I have realized that I CAN make a difference. If through my journey I inspire just one person, I have accomplished my goal! For that one person will also inspire another, and so on! We will make a difference! Thank you for taking interest in my website! I hope that you are able to find information that will help you along your journey and enjoy following my blog posts about my life, parenting, kids, food and family shenanigans! Together we will make the world a better place!